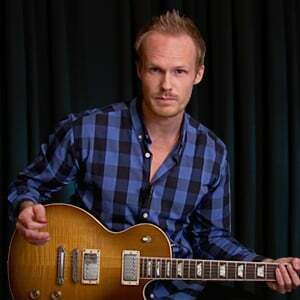 Swedish musician Ben Lindholm began playing piano and guitar at the age of 10. Inspired by a documentary where he saw Jimi Hendrix light his guitar on fire, he started taking guitar much more seriously. As an adult, he studied at the Musicians Institute in L.A., where he honed his skills and became a diverse player. If you're looking to shred, Ben will teach you how! But he doesn't stop there - with expertise, he also teaches lessons based around acoustic guitar, lots of great exercises, some Christmas songs, and even some bluegrass and funk licks. Just like in the Pentatonic Speedster tutorial, we will look at six very useful ways of playing licks from the standard blues scale fast. Nothing but the blues scale. These 16 lessons will teach you easy funk licks in the key of E. The first two lessons prepare you to play the licks and the backing track. The next half-dozen lessons teach you six must-know funk licks. Then, four lessons will teach you how to combine these licks to create longer licks and solos. I'll recap everything, then give you three jam tracks at different tempos so you can practice in real time at your own pace. In this tutorial I will teach you 6 more funk licks, this time over a different backing track with swing feel. Make sure you pay special attention to the what the drums and the bass are doing, and try to lock in. In this tutorial I will teach you 6 funky licks/riffs that you can practice over a funky backing track in A. They are largely chord-based which demands great muting control from your fretting hand. Make sure you pay attention to the strong swing feel. In this tutorial I will teach you 6 funky licks that you can practice over the included backing track in A. We will mix major and minor, single notes and chords - so be prepared for anything. In this first tutorial in my Bluegrass Lick Library series is for the novice guitar player who wants to venture into the land of bluegrass guitar. I will give you nine simple licks that you can use over a standard I IV V chord progression in the key of G major. We will practice them one by one, then three at a time, and ultimately all of them one after the other. Good luck! In the following seven lessons I will show you some of the most common patterns used in the shred guitar style. There's the diatonic scalar approach, a few pentatonic patterns and the classically inspired pedal notes. In the following 12 lessons, I will show you an example solo, packed with useful ideas that you can adapt and use in your own playing. The lessons in this tutorial are mostly geared towards hard rock, metal and shredding. But I'm sure novice players can pick up a thing or two too. In this tutorial you'll find some examples of melodic metal soloing played over simple metal/rock progressions to give you ideas for your own solo compositions! In this tutorial, I will go through all of the intervals you'll find in a major scale. It will take some time to learn them all, and be able to recognize them, but it's definitely worth the effort. If you haven't been playing the guitar for very long, the thought of getting into metal might seem overwhelming. But you can come a long way by learning the basics, which is what this tutorial is all about! I'll get you started on power chords and palm muting, scales, and getting an evil sound, all with examples. In this ten lesson tutorial, we'll expand on what we learned in Metal for Beginners I. Here I will recap the first tutorial in this series, then I'll talk about alternate picking and give examples, quick switching between palm muting and not muting, look at hammer-ons and pull-offs (it's hammertime! ), metal with a clean sound, and an epic intro! First I will explain to you what CAD tuning is, and why it can be useful. After that I will teach you a short little metal song I wrote just for this tutorial. At the end of the tutorial, as a bonus, I will also show you how you can take this tuning one step further, and tune to CADGCEb. In this tutorial, consisting of eight lessons, I will teach you my rock arrangement of Deck The Halls. Instead of adding extra guitar harmony to add dynamics to this song, like I did in my version of We Wish You a Merry Christmas, I modulated to the parallel minor key. So we'll start in the the key of F# major, and then modulate to F# minor, using the harmonic minor scale. In this set of 16 lessons, Ben Lindholm guides you through all the parts to the metal song "How The Story Ends", as made famous by Megadeth. Ben talks about the gear and tone, and then guides you through the numerous riffs that make up this complicated song. Ben will break down the incredibly advanced guitar solo in three parts. He'll also take a look at the acoustic classical guitar part in the song, and break down the bridge of the tune too. The story will end with a full performance play-along. In this tutorial, we will start by learning this recognizable melody, add harmony to it, and finally learn my rock version of the chords. Ideally, you would need three guitars to play the song this way, but two guitar sound just fine!